Vasco da Gama was the pet of fortune. Never did a man win immortality more easily. As a discoverer and a navigator he should rank not only below Columbus, but also below Bartolemeo Diaz and Cabral among his own countrymen, as well as Vespucius and Magellan, who carried the Spanish flag, and the Cabots, who established England's claim to the most important portions of the New World. As a commander, an administrator, and ruler of newly discovered regions, however, he ranks easily above them all. He not only led the way to India, but laid securely the foundations of Portuguese empire in the East. Even in the hour of his birth he was fortunate. Prince Henry, surnamed "the Navigator," to whose indefatigable exertions for more than forty years was due that impulse to maritime achievement of which the discoveries of the fifteenth and sixteenth centuries were the result, had just died, and his influence hung like an inspiration over the little kingdom for which he had wrought with such self-denying patience. This grandson of John of Gaunt has received scant credit for that wonderful series of discoveries by which the accessible earth was more than quadrupled in extent. Yet without him, there is no reason to believe that either the coast of Africa would have been explored, the Cape of Good Hope passed, or the American continents discovered for a century, at least, perhaps for two or three centuries afterward. He was the father of discovery, and it was his hand more than any or all others that rolled up the curtain of darkness which hid the major part of the habitable globe. All the navigators and discoverers of that marvellous age were but the agents of his genius and the creatures of his indefatigable exertion. The son of the most noted sovereign of Portugal, and grandson of that rugged Englishman from whose loins have sprung so many royal lines, he was fitted by descent and training for the heroic part which he performed. Distinguished for military achievement before he had come to man's estate, urged by four of the leading sovereigns of Europe to take command of their armies, and made Grand Master of the Order of Christ before he was twenty-five, there is hardly any limit to the military distinction he might have won or the power he might have secured, had he sought his own advancement. But he gave himself to Portugal, and determined to raise the little kingdom his father had so gallantly held against jealous and powerful neighbors, to the rank of a first-class power. To seek to enlarge a realm shut in by mountains on one side and the sea upon the other, by constant strife with embittered enemies, he saw at once was to invite annihilation. The sea afforded the only avenue of hope, the continent of Africa, where his father had already gained something from the Moor, in battling with whom he had himself won renown, the only visible opportunity. So he determined to explore, and finally, to circumnavigate Africa, and give to Portugal whatever of power or wealth the ocean or the dark continent might hide. He believed that India might be reached by sailing round its southern extremity, and he determined to pour the wealth of the Orient into the treasury of the kingdom his father had established. In 1418, therefore, he turned his back on personal ambition, laid aside the glory of military renown, and sat himself down to a hermit's life and a scholar's labors on the promontory of Sagres, in the province of Algarve, that point on the coast of Portugal which stretches farthest out into the Atlantic in the direction of his hope. Here he built an observatory whose light was the last his captains saw as they went forth, and the first to greet them on their return. Here he opened a school of navigation, and here were trained the discoverers who opened the way for all who came afterward. Here was not only nourished the impulse which fired the hearts of Columbus and his contemporaries, but here was taught the science and here were gathered the facts which enabled them to achieve success. Up to that time, Cape Nun had been the boundary of the modern world to the southward. With infinite patience, Prince Henry labored to convince his captains that the terrors which they thought lay at the southward of this point were wholly imaginary. Little by little his caravels crept down the coast of Africa. Every year he sent out two or three. Navigators and geographers flocked to his service. In two years he re-discovered Madeira and Porto Santo, of which latter he afterward made Perestrello, the father of Columbus's wife, the governor. By 1433 his ships had reached Cape Bojador; eight years afterward they passed Cape Blanco; in 1445 they were at the mouth of the Senegal. Still he urged them on toward that "thesaurus Arabum et divitia Indiae," to which he set himself the task of opening up the way. The crown of Portugal assumed all the cost of these expeditions. Gold, ivory, cinnabar, dye-woods, spices, and slaves, added to the wealth of the kingdom only to furnish forth new ventures. He died before the end came, but not until many of the most important problems of cosmographic condition had been solved. It was known by actual experience that the "steaming sea" was a myth. Ships had crossed the equator, and their crews came back to tell of southward-stretching shadows. Ships were able, it was seen, to sail up the southern slope of the world as well as down it. Why they did not fall off into space, none knew, but that they did not was proved. Gravitation was a force whose laws and character were yet unformulated. The diurnal motion of the earth was hardly suspected until a hundred years later. But the facts on which these two fundamental truths are based were being gathered for Newton and Copernicus. When he died, those whom he had inspired and instructed continued the work to which he had devoted himself, under the patronage of his brother Alfonso and his nephew Joao II. ; until, in 1486, Bartholomeo Diaz had sailed two hundred miles to the eastward of the Cape of Good Hope and returned to assure his sovereign that the way to India had at length been found. It was not, however, until Dom Manoel had succeeded to the throne, in 1495, that any successful effort was made to follow up the success which Diaz had achieved. The way to India was indeed open, but no one seems to have had sufficient fortitude to undertake so long a voyage in order to reach it by that route. Dom Manoel had, however, but one idea. He was not a geographer like his predecessor, Joao, "the perfect," but he was a man of action, and determined that the route Prince Henry's navigators had opened to India should not remain unused. Vasco da Gama was then in his thirty-fifth year, the handsomest man of his age, of ancient family, and it is claimed was not without royal blood in his veins. As a soldier he was trained in the war with Castile; as a navigator he had served under Prince Henry's best captains. Camoens, the historical poet of Portugal, declares that he was familiar not only with the recorded achievements of his predecessors, but with all the regions they had discovered. Dom Joao, on the return of Diaz, selected him to command the fleet he meant to send to follow up this discovery. In the ten years that elapsed before he actually sailed, it is probable that he had grown to be not only a better geographer, but also a stronger, more cool-headed, and reliable man. That he was able to command, those mutineers who cavilled at his severity during the stormy passage of four months from Lisbon to Table Bay, found out when they demanded that he give up trying to reach India and return to Portugal as other captains had done, at the behest of their crews. He made short work of them, and in his whole career, so salutary was the lesson, no one under his command ever again refused to obey his orders. "Anyone who will persist, is sure to sail around the southernmost point of Africa, and can then easily make his way up the eastern shore and across the gulf to India." Literally were his words fulfilled. With favoring breezes, Gama reached Malinda early in January, 1498, and securing the services of an Indian pilot, who had not only sailed hither from Calicut, but seemed as familiar as Gama himself with compass and astrolabe, he set out boldly across the Indian Ocean, and in May arrived at Calicut. When we consider that this latter part of the voyage was with a pilot accustomed to make the trip in the far more fragile crafts of the Arabs, the boldness of the undertaking does not seem so apparent to one of our day. Compared with the voyages of Columbus, Magellan, Vespucius, or Cabral over absolutely unknown seas, without pilots or charts of any kind, the passage from Aden to India hardly seems remarkable. Yet upon this the fame of Gama as an explorer rests, and as has been remarked, "few men have won fame so easily." His real merit lay in the fact that he did what so few of his predecessors were able to accomplish, controlled the mutinous crews, who had after all been the most serious obstacle in the path of Portugal to the coveted Indian possessions. It is probable that if Prince Henry had encouraged his captains to exercise greater severity, the darling object of his life might have been attained before his death and the birth of the fortunate explorer, whose cheaply-won fame has obscured his own, even with the king-loving Portuguese. It would seem as if the capacity to control men, which was so prominent a characteristic of the "Discoverer of India," was not of a conciliatory character, for the Zamorin of Calicut received him but coldly, and before his ships were loaded the difference had ripened into a quarrel, and he was obliged to cut his way out of the harbor to begin his homeward voyage. This lack of complaisance on the part of the Zamorin he attributed, not without reason, to the jealousy of the Arab merchants, whose swift-sailing dhows crowded the port. Why should they not be jealous of him who came to take away their immemorial privilege? Theretofore the treasures of the Orient had reached the western world only through the hands of the Arab merchants. The dhow and the camel had been its carriers. Gama had brought the more capacious caravel to bear them over a new highway to the western consumers. His success meant the loss of a great part of the business on which the sailors, merchants, and camel-drivers of Arabia depended for a livelihood. Why should they not conspire to kill him and destroy his fleet? His homeward passage was as fortunate as the outward one had been. That he did not experience the disasters which befell others, was no doubt largely due to the fact that he foresaw and avoided peril whenever possible. He was one of those men who, while shrinking from no unavoidable danger, take no unnecessary risks. He was received with unprecedented honors when, after two years and two months' absence, his ships were again anchored in the Tagus. Their rich cargo attested the rare value of the trade he had opened up. Despite the gold which the miners of Espanola were beginning to send to Spain, and the pearls which had come from Cubagua, the apparent value of the discoveries of Columbus were as nothing to the boundless wealth which Gama's voyage assured to Portugal. By the bull of Pope Alexander VI., all lands discovered east of the meridian of the Azores belonged to the King of Portugal. It was not only half the world, but that half which was of most inexhaustible richness, Asia and Africa. Titles and honors and wealth were conferred upon the fortunate explorer. In consideration perhaps of his royal extraction, he was permitted to affix the kingly title, "Dom," to his name. No wonder he was thus honored, when the cargo of one small caravel loaded with spices, yielded a greater sum than the whole outfit of the fleet Columbus commanded on his first voyage! In an incredibly short time, thirteen ships were fitted out, and under that prince of navigators, Cabral, set sail to secure the results of Gama's discovery. On him, too, fortune smiled as it rarely has on them that "go down to the sea in ships." Blown out of his course by head-winds, his very mishaps ripened into the rarest fortune, for he discovered Brazil, and thus added to his master's realm what was destined to be one of the richest kingdoms of the world. With the instinct of genius, and a courage as rare as it was heroic, he did not return to notify his king of the new continent which had risen out of the deep before him, but sending back a single caravel with the marvellous news, he turned his battered prows to that point of the compass where he judged the Cape of Good Hope to be, and after passing three thousand miles of water that had never known a keel before, he rounded the southern point of Africa and proceeded to carry out his orders. He lacked, however, the soldierly qualities and administrative power of the "Discoverer of India," who the year after his return was sent out to complete his work. This time he had a fleet of twenty sail, and from the outset was bent not only on taking permanent possession of the countries whose trade it was desirable to secure, but on avenging the affront that had before been offered him by the Zamorin of Calicut and the Arab traders who had inspired the action. On his way he founded the colonies of Mozambique and Sofala, and sailed to Travancore. During the passage he fell in with a ship which was carrying many Indian Mussulmans to Mecca, laden with rich presents for the shrine of the Prophet. This he pillaged and burned, with all of her 300 passengers except twenty women and children, whom he saved more for his own pleasure, no doubt, than from any pity for them. He excused this act of savagery, so far as any excuse was necessary, on the ground that they were paynim Moors, and some among them had incited the attack upon him at Calicut on his former voyage. The truth is they were rich; he wanted the plunder; and there was less likelihood of trouble if he killed them than if they were left alive to publish and avenge their losses. It was merely an application of the freebooter's maxim, that "dead men tell no tales." Arriving at Calicut, he found that forty Portuguese who had been left to establish a permanent post, had been killed. With unusual deliberation, he investigated the matter and demanded reparation, submission, and a treaty acknowledging the sovereignty of Portugal over India. This being refused, he bombarded the city, burned the ships in the harbor, and compelled the Zamorin himself and all the native princes of the region to submit and acknowledge themselves feudatories of Portugal. So rapid were his movements, and so accurate his calculations, that before the close of 1503 he had reached Lisbon again with thirteen vessels laden to the gunwale with the plunder of the Orient--by all odds the richest argosy that had come to any European port since the days of the Romans. Da Gama was now forty-three years old, and must have been in the very prime of manhood. Why so skilled a navigator, so intrepid a commander, so shrewd a negotiator, and so successful an administrator, who had established the power of Portugal from Delagoa Bay to Calcutta, should, at that period of his life, have been laid upon the shelf for twenty years, is a conundrum hard to answer. Knowing the character of Dom Manoel, it is not difficult to guess that his sordidness lay somewhere at the bottom of the trouble; but it is said to Gama's credit, that he neither whined nor remonstrated. It must be admitted, however, that he was succeeded by one who was greatly his superior both as a general, a statesman, and an administrator. If Vasco da Gama laid the foundations of Portuguese empire in the East, Alfonso d'Albuquerque, "the Great," broadened and built upon them as he could never have done. From Aden to Cochin blood flowed beneath his blows, but peace followed; and though he was termed "the Portuguese Mars," his justice became traditional, and his sagacity was shown in the permanence of the settlements he made, even under the incompetent viceroys who followed him. 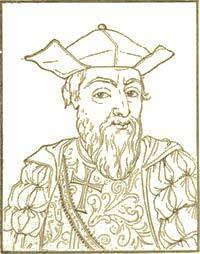 It was twenty years since Vasco da Gama had commanded a ship. Albuquerque was dead, and his successors had brought shame and defeat upon the Portuguese power in the East. Dom Manoel was dead also, and whatever grievance he had against "the Discoverer of India," seems to have died with him. His successor, Dom Joao III., casting about for someone to bring order out of confusion, success out of failure, and honor out of shame, called again into his service the courtly and sagacious mariner, now over sixty years of age; and conferring upon him the title of viceroy, sent him to retrieve the prestige his successors had lost. His high spirit was yet undaunted, and when he neared the coast of India and found the waters in a strange ferment for which no one could account, as there was neither wind nor tide, he said loftily: "The sea beholds its conqueror and trembles before him!" It sounds bombastic, but in the mouth of one who had first guided a civilized keel over its surface, such arrogance is at least pardonable. In the few months that intervened before his death he made the power of Portugal once more respected in the East. When he died in Cochin, in 1525, he was mourned by the natives as a just ruler, and by his countrymen as one who had saved to Portugal the richest part of the national domain. It is not strange, therefore, that when his ashes were conveyed to Lisbon, they were received with a pomp almost equal to that which greeted him when he came as the discoverer of the Orient and its priceless treasures. It is rare in history that one receives two triumphs, the one while living and the other when dead, especially in connection with the same achievement; but it is rarer still that one who has won immortality should leave a record so singularly free from bickering and strife as that of the dignified and self-contained Portuguese rival of Columbus, Dom Vasco da Gama, the "Discoverer and Sixth Viceroy of India, Count of Vidigueira," where he lies entombed. Little is known of his private life; but there seems no doubt that it was free from the stains that obscure his great rival's fame, from whom he also differed in the fact that he neither begged nor boasted, and in old age was honored even more than in his prime.